For the first time in eight years an Australian has won the Crocodile Trophy! Mark Frendo conquered the oldest and hardest mountain bike stage race in the world and after nine days, 900km and more than 15,000m of elevation finished in 30:40:17 ahead of the Canadian Cory Wallace and Jiri Krivanek from the Czech Republic. Paul Mashford (AUS) is fourth and today’s stage winner Josef Benetseder finishes the 19th Crocodile Trophy in fifth place. Fantastic result by Liesbeth Hessens – the fastest woman finishes 21st in the overall classification and wins ahead of the Italian racers Giordana Sordi and Maria Cristina Prati. The 19th Crocodile Trophy finished today on Cooktown’s Grassy Hill. The oldest mountain bike stage race in the world had started last Saturday in Cairns and took riders across the Atherton Tablelands to historic mining towns deep in the Australian Outback. The race tracks throughout the nine day event included singletrails in Smithfield, marathon races through race forests, across Outback Highways and rough mining trails as well as a time trial stage on day seven. Sandy terrain, corrugated roads, narrow and flowy singletrails, gruelling climbs and fast descends – the Crocodile Trophy showcased the best mountain bike trails that Far North Queensland has to offer. “I’m so happy, it hasn’t set in really yet. But it's a big achievement for me and I'm proud to have claimed a win for Australia after such a long time”, said a relieved Mark Frendo at the finish line today who is the first Australian Crocodile Trophy winner since Adam Hansen in 2004 and 2005. The 28-year old had to defend his early race lead over the past few days against none other that the Canadian National Marathon Champion and Mongolia Challenge winner Cory Wallace who finished with a gap of more than 12 minutes. He was motivated now to keep racing more, but it was still too early to say if he would be at the start next year, the exhausted race winner added. “I’ll be back for sure”, Cory Wallace promised instead. “This race is just too much fun, next year I’ll bring more Canadians – they will love this versatile race track!” Jiri Krivanek finished in third in the overall classification and was happy with his performance. “I’ll be back 100% next year as well”, the Czech rider agreed with Wallace. Today’s stage was won in a finish sprint on the 30% gradient climb to the top of Grassy Hill, again by the Austrian Benetseder. “Today was a tough one – I could almost not get away from Frendo. He still attacked on the last 200m before the finish, but I managed to get ahead again”, said Benetseder who had won the Cooktown stage winner last year and had been keen to repeat his result. The Belgian adventure racer Liesbeth Hessens has been the undefeated womens stage winner for nine days in a row and takes out the race win. “This was the longest and hardest race I’ve done and I’m so happy that I did so well”, said an emotional Hessens at the finish. Organiser Gerhard Schönbacher said that he and his team have already been scouting new and even more exciting race tracks for next year, “The Crocodile Trophy is the toughest mountain bike stage race in the world. 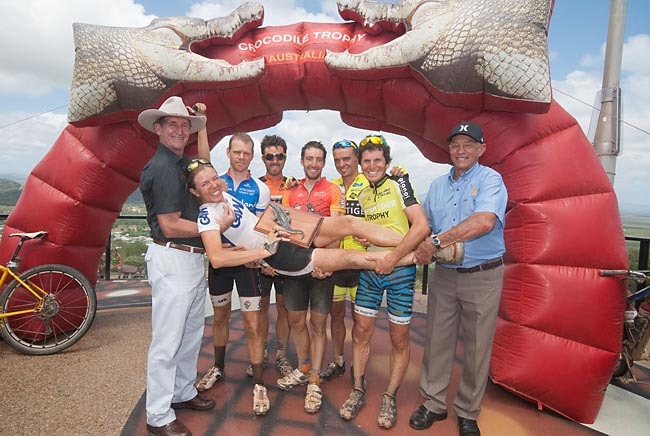 We feature a wide variety of stage routes including fun and exciting mountain bike sections as well as less technical yet tough trails and Outback Highways, which challenge the endurance skills of our riders.” The Crocodile Trophy will return to Cairns and Far North Queensland in October 2014.